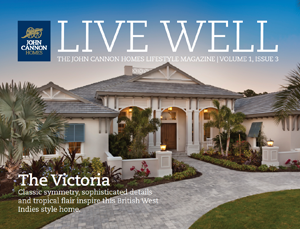 the John Cannon Home team meets with you, we understand it’s your legacy we’re helping build. Whatever your style of architecture; Coastal, Transitional, Contemporary, Spanish Colonial, Mizner or Italian Med, we can design and build the home you envision. It’s your dream home and we’re going to make sure it is exactly what you want. achieve a sense of timeliness you want in building a custom luxury home. Open and inviting, warm and comfortable. Style without pretense. Expertly designed and hand-crafted for your unique lifestyle and vision. are generously appointed with top-of-the-line appliances and feature abundant storage and beautifully custom-built solid wood cabinets, ample wine racks and coolers, walk-in pantries and family-friendly islands; rich textures of sumptuous stone, marble, wood and tile, and multiple workspaces all combine in a John Cannon Home to create the perfect recipe for entertaining. are unique, private, spacious retreats which can feature stepped ceilings, double French doors, arched doorways, custom closets, creating your own special sanctuary. feature deep soaking tubs, intricate patterned mosaic tile, oversized showers, his and her vanities, even outdoor private courtyards with fountains and showers for the ultimate in pampered luxury. exemplify why you’ve chosen Florida as your home with incredible vistas created with John Cannon’s signature disappearing glass walls, pool enclosures providing unobstructed views and custom designed water features. The joys of outdoor living abound with entertaining options like summer kitchens, custom-designed pools and spas, firepits and fireplaces. there are so many choices and John Cannon Homes knows just the right way to combine them all. We build homes where friends are welcomed and elegantly entertained. Homes where your family will gather to share stories and make memories for generations to come.